In our Banquet & Production class at school, each week we are given a certain protein. For example pork. And with this protein we use our butchery skills to butcher the piece of meat into workable sizes to produce about four different dishes. Last weeks lab was pork. The best part about this class is our chef challenges us to make one more dish using any of the extra ingredients we have or any of the spice supplies in the lab. I took on this challenge and was inspired by last weeks Top Chef Canada where Connie showed supermarket goers how to make sausage at home! 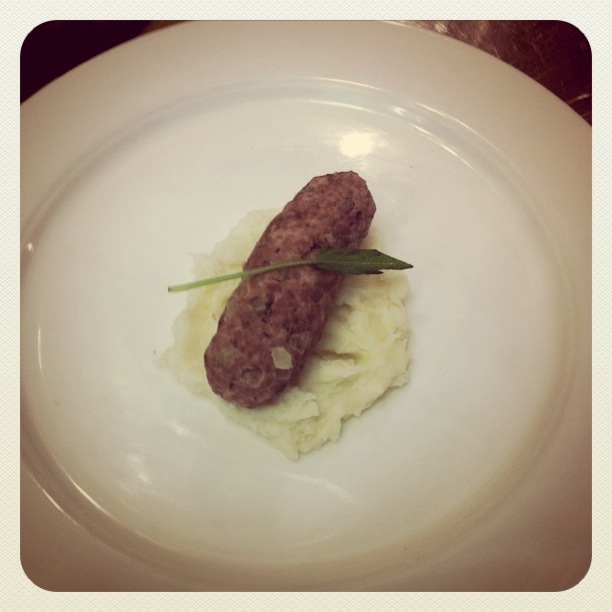 I settled on making a pork sausage, seeing as we had leftover ground pork, apples, onion and sage. A classic pairing combo with pork is apples (pork & applesauce), so I cut up some apples and onions into small cubes, brunoise as its called and sauteed them off so they were a bit soft. I then mixed in chopped sage, some white pepper, garlic powder and a pinch of nutmeg and salt. Before making them though, I fried off a piece to make sure they tasted alright, and I must say, they really were delicious! As Connie showed us on Top Chef, you can easily make your own sausages by rolling out a long tube in a piece of plastic wrap and then poaching in simmering water on the stove! It was incredibly easy, and you really could do this at home! Here is a picture of my dish! The sausage shape is not the finest, but at least it tasted great!